Most of us don’t have the tools to easily create PDFs – particularly with advanced options — and don’t want to learn a complex application like Adobe Acrobat to do so. Softland’s novaPDF is an easy-to-use tool to create PDFs from any application that supports printing. NovaPDF for Windows isn’t just another way to print to PDF – it’s full-featured PDF creator with support for password protection, document permissions, digital signing, and other advanced features. 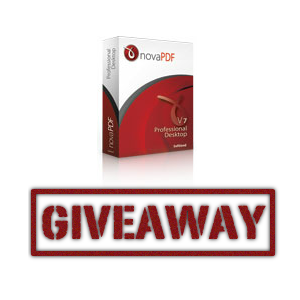 This week we’re giving away 25 copies of novaPDF Professional Desktop 7 worth a total of $1250! Read on for your chance to enter our giveaway and win your own copy! While novaPDF installs itself as a virtual printer, there are also other ways to use it. You can launch the novaPDF application to load a file from your computer and directly convert it to PDF. You can also use the included Microsoft Office add-in – just click the novaPDF tab on the ribbon and use the Save as PDF button. Open any application’s Print window and you’ll see novaPDF available as one of your printers. You can even make it your default printer. Print with the novaPDF printer and you’ll see the novaPDF save dialog, which allows you to adjust your settings. By default, novaPDF will create a new PDF file and open it with your default PDF viewer afterwards. From here, you can also have novaPDF add your document to the beginning or end of an existing PDF file, apply a password to the PDF file, or send the PDF file via email — the PDF can be send via email automatically or attached to an email in the system’s default email client. You can also click the PDF/A-1b check box to create a PDF/A file. PDF/A is a PDF standard designed for long-term archiving – for example, it embeds fonts rather than linking to them on the system and doesn’t allow passwords that may impede viewing in the future. Click the Change Options button to adjust settings for the current PDF print operation. You can set the title, subject, author, and keywords – particularly useful if you’re posting the PDF online, as these fields will be indexed by search engines. You can also change the default options PDF viewers will use when they open your PDF file – for example, you can have the PDF automatically open on a specific page. The other tabs allow you to change the graphics compression settings and the email server that will be used when sending the PDF by email. On the Security tab, you’ll find encryption, password, and permission settings. The permissions check box lets you control whether users can print, modify, and perform other actions with the PDF. You can set different user and owner passwords – when someone opens the PDF with the user password, they won’t be able to adjust the document permissions. NovaPDF ships with an informative help system, so you can always click the Help button if you’re not sure what an option does. The help system provides in-depth explanations of each option. NovaPDF also has many more options than appear in its default save dialog. To access more novaPDF options, click the Preferences button in the print dialog. You’ll find a dialog with a variety of tabs for every possible type of PDF option you’d ever want to configure in novaPDF’s print preferences window. You can adjust settings for page sizes, font-embedding, and a wide variety of other options. NovaPDF attempts to automatically detect and create links and bookmarks – you can customize that behavior here, too. You can also automatically apply a watermark or overlay to created PDFs. If you don’t like the save dialog that appears every time you create a PDF with novaPDF, you can define your settings and set novaPDF to automatically create PDFs without prompting you. NovaPDF can also sign each PDF document you create with a digital signature. This allows others to verify that the document is authentic – they’ll know you created it and that it hasn’t been modified after creation. This can be particularly important for professional communications. NovaPDF also includes support for profiles. If you have different groups of settings you want to use, you can create a profile for each. NovaPDF can also show a Select Profile dialog while printing, so you can quickly choose groups of settings without the hassle of adjusting settings back and forth or toggling between profiles in the preferences dialog. You can download a trial version of novaPDF Desktop Professional to test it out for yourself. The trial version doesn’t have a time limit and includes all the features of the full version, but it adds a notice to the footer of each page. To create PDFs without this notice, you’ll have to buy a copy ($49) – or win one in our giveaway! This week we’re giving away 25 copies of novaPDF Professional Desktop worth a total of $1250! How do I win a copy of novaPDF Desktop Professional 7? Congratulations! If you were selected as a winner, you would have received your license via email from jackson@makeuseof.com. If you require any assistance, please get in touch with jackson@makeuseof.com before July 13. Enquires beyond this date will not be entertained. This giveaway begins now and ends Friday, June 29th. The winners will be selected at random and informed via email. Explore more about: Digital Document, MakeUseOf Giveaway, PDF, PDF Editor, Printing. The "giveaway" is sneaky. It is in fact a drawing, and is in fact for 25 copies that normally cost $50 each. (25 x $50 = $1250) For me, knowing that you are dishonest destroys any value in MakeUseOf.com. You also are corrupting the idea of a social group. You are in fact getting +1 approvals by pretending to offer something of value. This is how all our giveaways work. We can't very well give 10000 copies away -- we only get a certain amount of copies to give away. I'm sorry you feel that it's sneaky. However, it's true -- we are giving away that much software. If you don't want to participate, it's not mandatory. Lots of our readers enjoy these giveaways -- particularly for hardware. We've given away iPads, $1000 PCs -- and yes, when we give hardware away, we do a drawing and give a single piece of hardware away. We can't afford to give away an iPad to every reader. I currently use NitroPDF and doPDF. This appears to have quite a few features that Nitro doesn't. Thanks for the opportunity! what is the difference that novapdf and dopdf ? i don't see any.. can someone let me know. Oh please, please make Facebook show the unlock code. I 'd really like to try this prog. Grrr. Still no code via Facebook. Pls fix. Tnx. Great Giveway! Thanks very much! Does it support Linux Platform...??? P.S. Thank you, most appreciatively, for the free copy of BatchPhoto! It's a great tool that I will definitely get mega-use out of. There is no giveaway code at the facebook page, please fix it. I've forwarded your comment along to the person responsible!